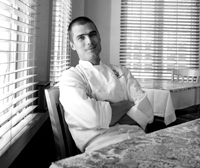 Home Uncategorized Is Hugh Acheson opening a restaurant at Ponce City Market? Is Hugh Acheson opening a restaurant at Ponce City Market? When Ponce City Market opens this spring, will Hugh Acheson (Empire State South, Five & Ten, the National, and the Florence) be among the tenants? We think so. Jamestown president Michael Phillips was recently quoted in a Women’s Wear Daily article saying that Ponce City Market’s Central Food Hall will feature “four James Beard award-winning chefs.” The article then states that Phillips was referring to “Anne Quatrano, Sean Brock, Linton Hopkins, and Hugh Acheson.” The article was posted in full to Jamestown’s website, but representatives for the group would not elaborate. “Jamestown cannot and will not confirm or deny this at this time. When and if there is an announcement to make, Jamestown will announce it when they are ready,” says Sandi Parker, Jamestown Properties senior manager. “At this time all I can say is that nothing is finalized yet,” says Ashley Malec, Acheson’s publicist.